It is edgy. It is seedy. It is touristy. And it probably deserves all the bad press it receives. 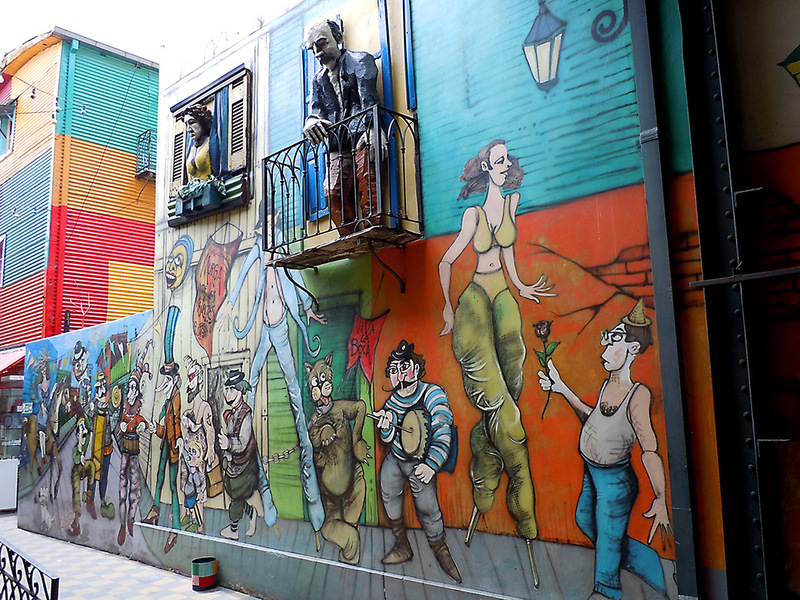 But there is no denying the sense of drama and theatre in the psychedelic barrio of La Boca. A throwback to its maritime history and the meshing of cultures of early immigrant settlers. The name is said to be derived from its location at ‘La Boca’ (the mouth) of the Riochuelo river, and the port where the Spanish first landed in 1530. Others claim the barrio was named after ‘Boccadasse‘ a neighbourhood in Genoa, by Genoese immigrants who landed three centuries (and independence) later, in the by then gritty meatpacking and tanning district. The Spaniards had long since moved inland, leaving only their African slaves behind. The area further declined when the shipping industry was transferred to the new port in Puerto Madero. The most touristy part today, thankfully rendered less overwhelming by the fact that it was the day of the presidential election, is the one time railway route of El Caminito. Now a cobbled pedestrian street lined with brightly painted tin tenements called Conventillos, that could very well have been backdrops for stage productions! The reality is less romantic. These Conventillos, originally built by the Genoese from scrap metal and waste paint from the shipyards are congested living quarters with cooking, washing and toilet facilities shared by several families. The ones in the Caminito have been turned into souvenir shops. But similar conditions apparently prevail, in the bylanes out of the tourist circuit where the marginalised population of the ‘Paris of South America’ live. Hence the need for caution and the repeated warnings to leave your Rolexes and designer bling at home. And expensive cameras too. Just carry with you what will not hurt you too much to lose. And never venture there on foot at night. To be fair, we never sensed any danger here or anywhere else in South America. Not even in Rio. We appreciated the relative quiet of election day, but its downside was that we missed seeing the impromptu Tango dancers that this barrio is famous for. In fact Tango is supposed to have been born here. Evolved from the tangle of European cultures that make up Buenos Aires, and from the bawdy dances of immigrant labourers hoping to impress the then minuscule female population of their barrio. Another casualty of the elections was our plan to experience the fanatical fervour of a ‘super classico’ clash between the local Boca Juniors and River Plate football teams at the Bombanera stadium. 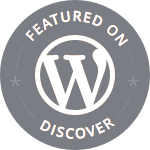 Sigh……. 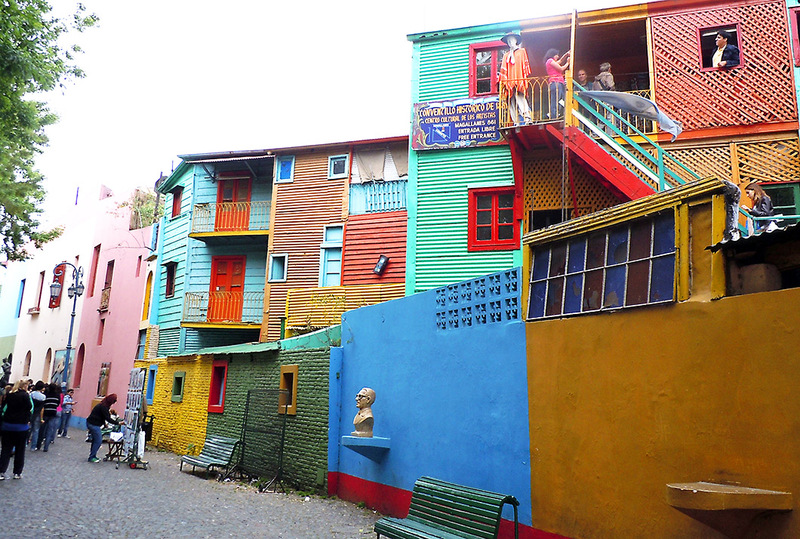 The revival of El Caminito and La Boca in the 1950’s is credited to renowned Argentinian artist Benito Quinquela Martín who spent his childhood here. He gathered neighbors to re-paint the houses in their taditional bright colors and urged the government to declare the street an open-air museum. 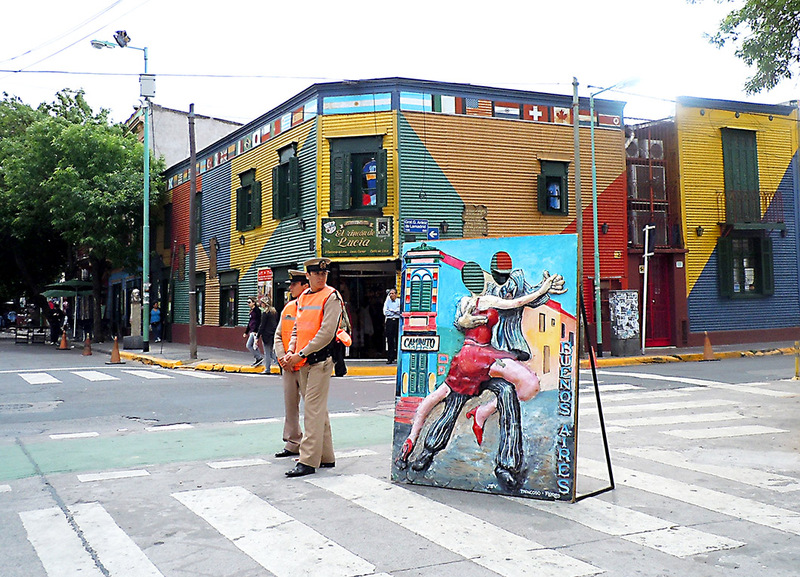 (Caminito is derived from a Tango tune co-authored by his friend Juan de Dios Filibrito also a La Boca resident.) 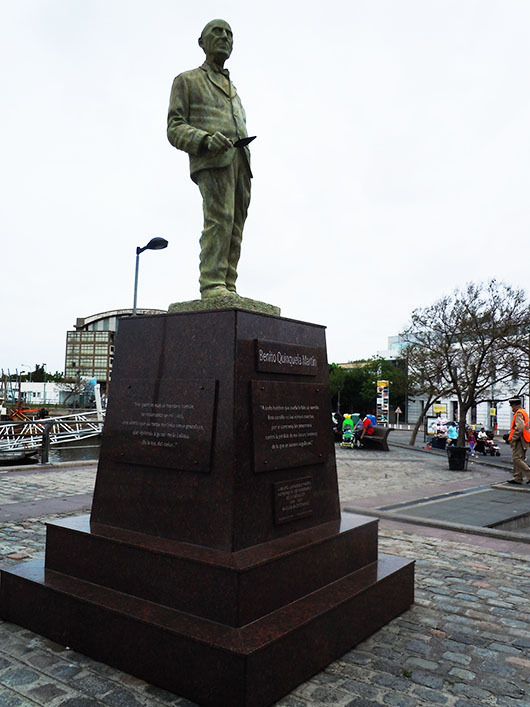 In 1936 he set up an art school in the Vuelta de Rocha, the square facing the river, which has been transformed into the Museo de Bellas Artes de La Boca Quinquela Martín to display his works donated to the city, along with those of contemporary Argentinian artists. On the cover of the coffin was a painting of the port of La Boca. Thanks to Marcia I was introduced to this fine commentary. South America is a fascinating place to visit and has so much interesting history.